Hello folks, welcome to the brand new article. In this article, we are going to discuss Best University For Computer Science in Pakistan. Maybe you are studying in 12th class and you have interest in Computer Science. The next step for you is to find the best university in Pakistan for your undergraduate education. This article will go through the list of Top 5 Best Universities for Computer Science in Pakistan. This is not an official list. The list is arranged by me, base on my own research. This list of best universities for Computer Science in Pakistan contains all the details about the mentioned university. You will find the review of each university. The standard of education is reviewed by the students who are studying in the specific university. I collect the review from different students on Quora and other platforms about the standard of education of below-mentioned universities. If you are computer enthusiastic, go to your favorite university. The four years of graduation will decide your career and future. Think wisely, act wisely, and decide wisely. Your future is in your hands. There are different universities in Pakistan that offering a bachelor in Computer Science. The standard of education is very low in most of the universities and one needs to choose the best university for computer science. Some of them are not recognized with HEC and some don’t even have proper labs. Read the article carefully and make the decision on the basis of your research. The field of computer science is a little complicated as you have to deal with programming and algorithms. But by choosing a proper university, you don’t need to worry about your future. Computer Science is the study of the theoretical and practical aspects of computer technology and computer usage. You need a university that can make you to the way of success in the computer science field. Computer science is booming and there are more jobs than competent programmers out there. At this point, I’d advise you to go through this article and select a university that best suit your requirements. Let me know in the comment section below if you know about any other best university for Computer Science in Pakistan. Note: This not an official list. This list “Best university for Computer Science in Pakistan” is arranged by me based on my own research. I listed the universities on the basis of practical work and standard of education. I randomly arranged the list, you can find a university that best suits you. FAST is the best university for computer science in Pakistan. It was founded as a Federally Chartered University in July 2000, the National University of Computer and Emerging Sciences is a premier University of Pakistan. FAST is famous for quality education and the impact of its students in the development of local software and other industries. The university has five modern campuses at Karachi, Lahore, Islamabad, Peshawar, and Chiniot-Faisalabad. These campuses deliver world-class educational environment and entertaining facilities to about 9,000 students, around one quarter are female. The computer science program of FAST is one of the best programs in term of quality education and labs. FAST have the best computer science labs in Pakistan. Below is the detailed review that was posted on Quora by the student of FAST. FAST is the best university for Computer Science in Pakistan. Quality education is the first priority at FAST. The university has one of the best faculty of computer sciences in Pakistan. You will have the access to quality education and labs in the campus. Being the best university for computer science in Pakistan FAST provides the students with the job opportunities. You can join a company of your choice after graduation. You can also start your own business. The aim of the FAST is not just made you graduate in your studies. The university aiming to produce graduates with ethical manners. FAST conducts many technical and non-technical events for the exposure of student and entertainment as well. Different events like SOFTEC which is one the biggest tech event arranged in Pakistan on the university level. In the list of best universities for computer science in Pakistan, the ITU(Information Technology University) is one of the emerging university. This university is located in Lahore. ITU starts its journey in 2012 to provide the students with quality education. If you are planning to take admission in the best university for computer science in Pakistan you can consider ITU. The university aims to produce the freelancer in Pakistan. Comsats is another great option if you are planning to join computer science program in Pakistan. Comsats is among the best university for Computer Science in Pakistan according to HEC ranking. I have some friends doing BS in computer science from Comsats. They are really satisfied with the environment. The Comsats focus on lab work. That’s the reason the university is leading in term of quality education in computer science. You can consider Comsats if you are planning to join computer science program. But at the same time, the semester fee of computer science program is too high. The National University of Sciences and Technology (NUST) aims to appear as a leading research concentrated university of Pakistan. NUST is also recognized as the ‘best university for Computer Science in Pakistan’. Due to the popularity of this university, it is really difficult to get admission but your hard work can lead you to get admission in any university of your choice. NUST School of Electrical Engineering and Computer Science (SEECS) offer the Computer Science program for the passionate students. The university is popular worldwide and you can also get a job of your choice in the giant platform like Amazon, Google, Facebook etc. The graduates from NUST are working in different famous countries around the globe. If are going to get admission in government sector university for computer science, PUCIT is the best choice for you. It is the best university for Computer Science in the government sector. It’s a government sector university in Lahore. It has a very low fee as compared to private sector universities. 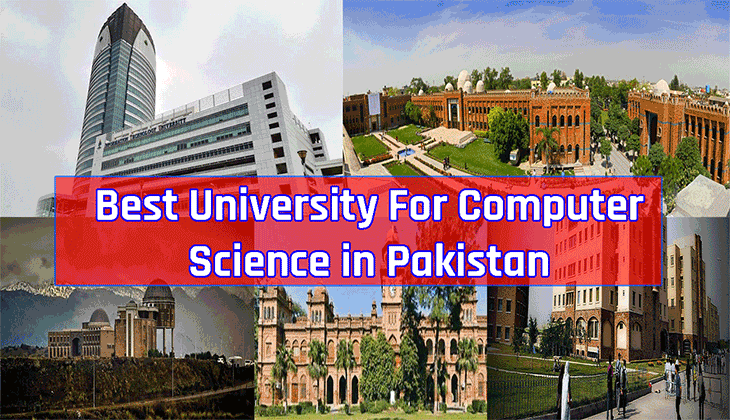 PUCIT also in the list of top universities for Computer Science in Pakistan. But in the government sector, it is the best university for Computer Science in Pakistan. Share this article with your friends and fellows. Let me know in the comment section below if you know about any other best university for Computer Science in Pakistan. If you have any suggestion kindly let me know through mailing address or comment section below. Feel free to ask any follow-up questions. Good luck!